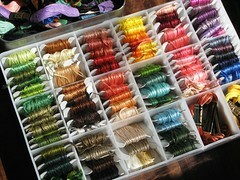 After seeing Di show Soozs’ embroidery thread box, I’ve been meaning to share mine. This is only some of what I have. Some I’ve bought over the years for various needlework projects, others are from Mum’s embroidery days in the 60’s and the threads in the tin were a recent charity shop find from DH’s Grandma. Lots of green, purple and brown, which I’m sure will come in handy one day. There’s also a beautiful handmade wooden box back home with my Granny’s threads in. Now some of those I think were her Granny’s – they’re silk and very old but the colours have survived brilliantly. I remember endless hours of sorting out the colours for her when I was little. Such fond memories.